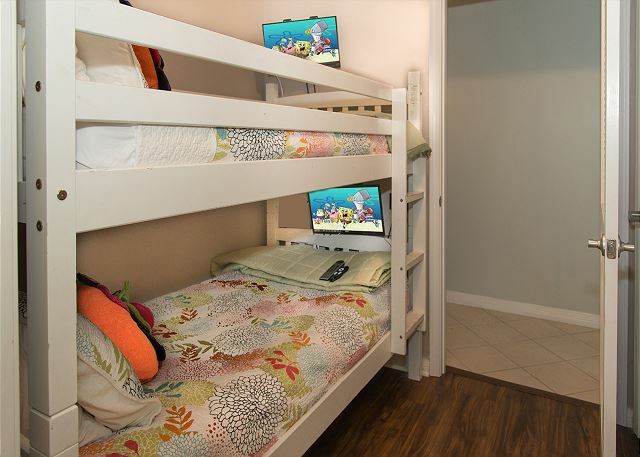 This beautifully decorated condominium offers a King bed and triple dresser in the master bedroom with a spacious master bath, a Queen-sized sleeper sofa in the living room, and a set of Twin bunk beds. The TV's throughout this condo are flat screen and large. The living room tv is a 60 in smart tv with blu ray player, the bunkroom has a separate tv w/DVD for each bunk and the master has a 50in flat smart tv. 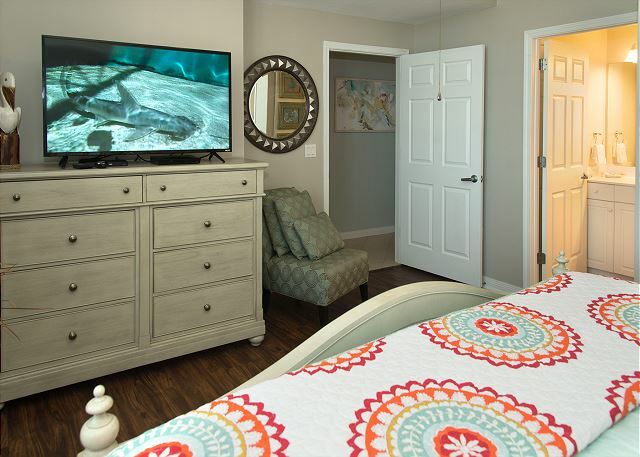 So when you come in from the beach or the lazy river you can relax in your bed or on the sofa and enjoy your favorite shows on a large flat screen tv. 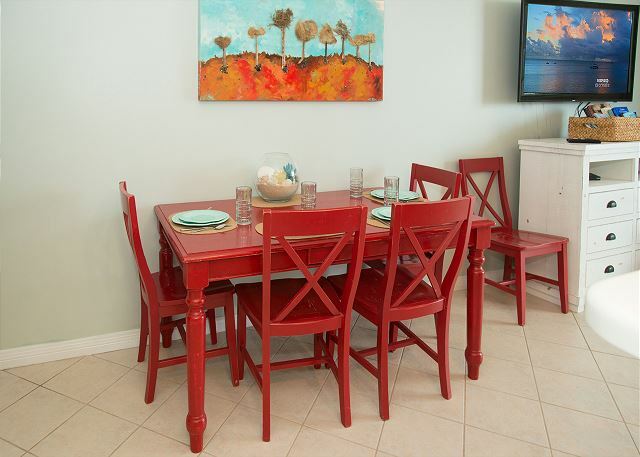 The open floor plan offers a fully equipped kitchen, dining table with seating for six, and four bar stools. Dine outside on your patio table for four if you prefer! 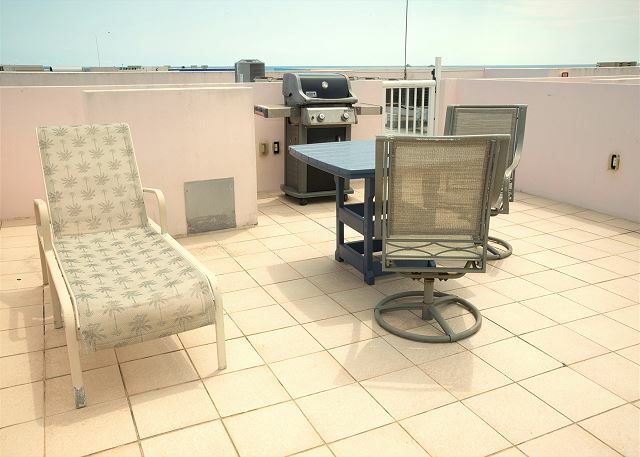 There is a private gas grill on the rooftop above the unit. 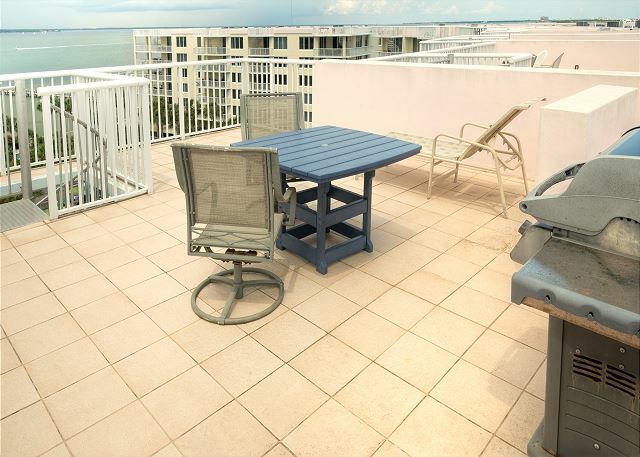 You may also prefer to sun bath up on the roof, too! 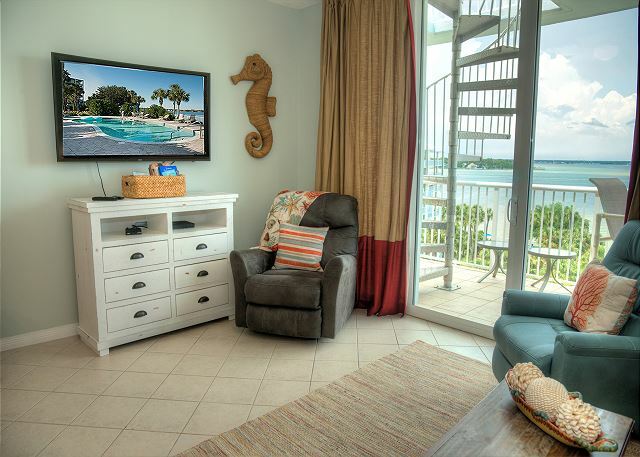 The views of the ocean and bay are unlike most other units at Destin West. 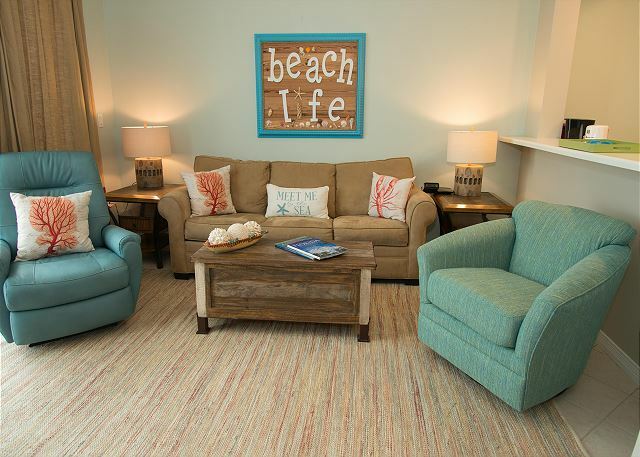 Your living area leads you to a tropical paradise and private convenient beach access is available. 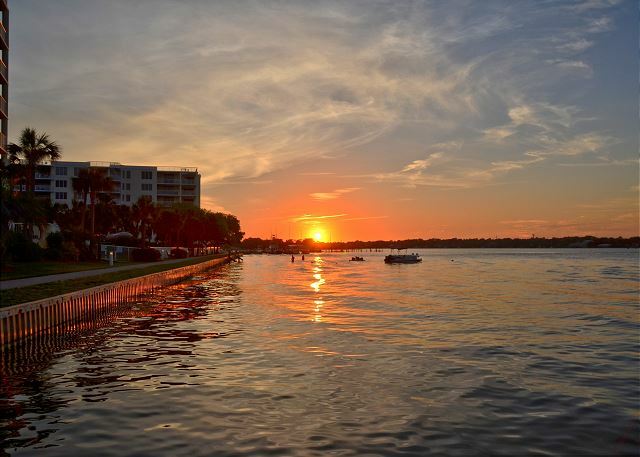 Destin West Beach & Bay Resort is a beautiful community featuring some of the most spectacular views of the Emerald Coast. 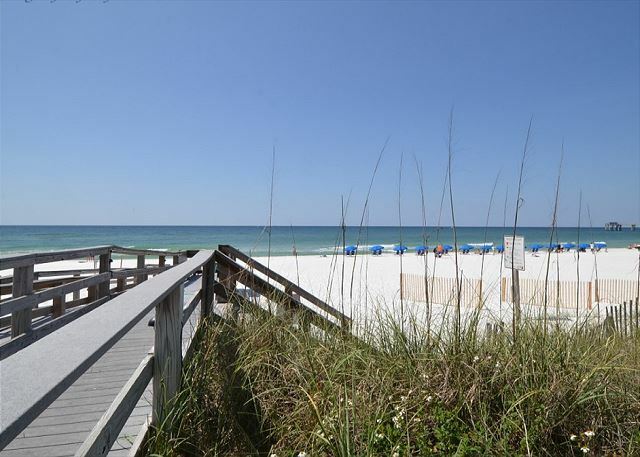 Destin West beaches offer secluded sugar-white sands with activities for the whole family. Relax by the Gulf-side pool, soak in one of the whirlpool spas, or enjoy an amazing sunset and watch as the Lazy River transforms into a beautiful array of light. 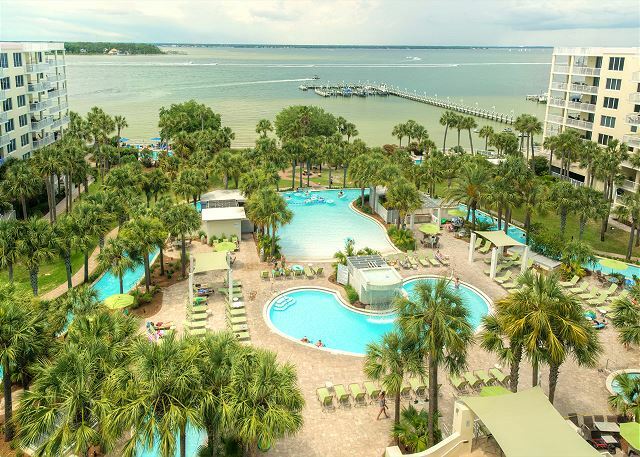 With just the right amenities, Destin West Beach & Bay Resort is a great place to relax and enjoy a family vacation. A large pool with water fall, two hot spas, and a 700 foot lazy river are located bayside. 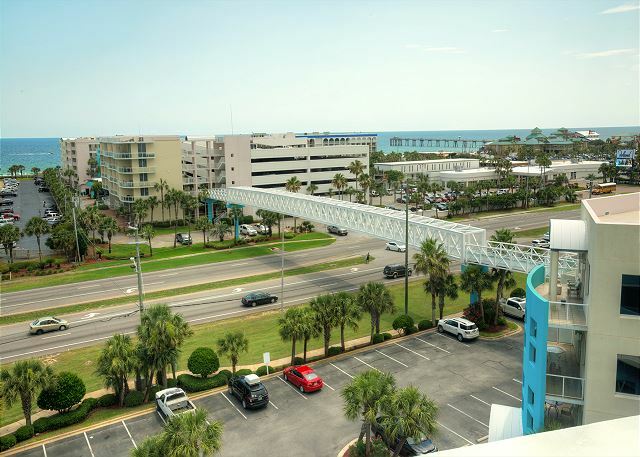 Ideally located on Okaloosa Island, Destin West is home to some of the area’s finest restaurants, entertainment, shopping, fishing, water sports, and the Emerald Coast Convention Center all within walking distance. Destin is well known as the World’s Luckiest Fishing Village largely because of it roots as a top fishing destination and quick access to deep waters of the Gulf of Mexico. Destin boasts the largest charter fishing fleet in the state of Florida. If you have an interest in charter deep sea fishing – Destin is the place. But, there is much more to Destin than charter fishing. Destin has evolved over the years to be a top beach vacation destination. Featuring sugar white sand beaches and emerald colored water, it is an absolutely beautiful area. The town itself offers many upscale shopping, dining, and entertainment opportunities. Much of the development of the area has been done with luxury lifestyles in mind. Destin also has one of the busiest private airports in the country. The condo was clean. Beautiful just as shown in the pictures. Everything was as described. We would definitely rent here again! A lovely condo with great view. Dear Ms. Weikert, Thank you so much for the lovely review! Pelican PH-06 has some of the most beautiful views of the island, in my opinion! We hope you'll be back again soon! Dear Mr. Sheets, Thank you so much for your five star review of Pelican PH-06! We love hearing from our guests and will look forward to helping you book your next visit whenever you're ready to come back! This was our first stay at Destin West and we absolutely loved it. The unit was super clean, stocked with supplies and beautifully decorated. 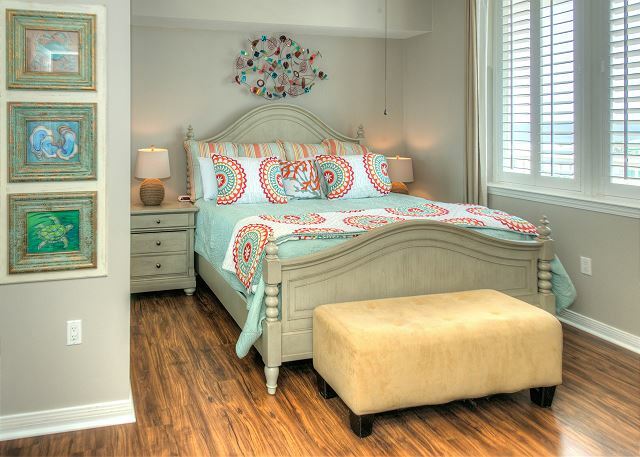 The location is awesome, you can walk to everything and the amenities are high class! Enough to keep everyone entertained. The management team is on site and very responsive. We loved our stay and will definitely be going back. Dear Ms. Bartlett, Thank you so much for taking the time to leave us this amazing review! I couldn't agree more about PH-06 Pelican. It truly has everything! We're so glad you enjoyed it and will be waiting to help you with your next stay! The overall experience was excellent from when we first booked it until we checked out. The unit was exactly as described and shown in the photos. It had everything we needed for the week in the kitchen and also had a keurig machine in it as well which was a nice feature. The unit was overlooking the bay and lazy river. We spotted dolphins several of the days of our stay and took advantage of the lazy river every chance we could. The furniture in the living room were very comfortable and our king size bed in the bedroom was cozy and had a lot of room to relax and sleep after the day out. There are a lot of different beach chairs, toys, wagons, etc. in the garage which makes it easy so you don’t have to lug extra things from home, which is nice. Overall experience was excellent. We will be back again next year for sure. Dear Mr. Besher, I completely agree that Pelican PH-06 is a wonderful unit! We're so happy to hear that you loved your stay with us! Thank you for recommending us to your friends and loved ones! We'll be looking forward to helping you plan your next stay with us when you're ready to come back our way! Loved staying at the Pelican PH-06. Very clean property with the perfect setup for 2 adults with 2 small kids. Beautiful view from the balcony and grilling on the rooftop was very convenient. We got to watch fireworks from our rooftop on July 4th as an added bonus. 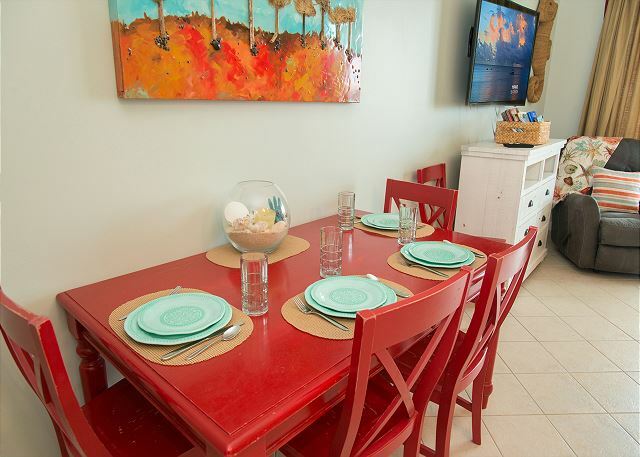 Great location to be close to the lazy river and pool, and a short walk to the beach. We would definitely rent this condo again. Dear Ms. James, We're thrilled to hear that you had a wonderful time in this newly refreshed condo! It is the perfect place to spend 4th of July! We'll be standing by to book your next trip down whenever you are! Lazy River is the best. Great resort, amenities, and location. I would recommend this condo and will be back. Dear Mr. Plaster, Thank you for your great review! We love knowing that you enjoyed your stay with us, and are ready to book your next trip whenever you are! Very clean, the view from the roof top patio was amazing. There is a gas grill that was very useful. There is a larger table in the living room/dining room than the picture showed which was a nice bonus. Enough seating for a family of 4. 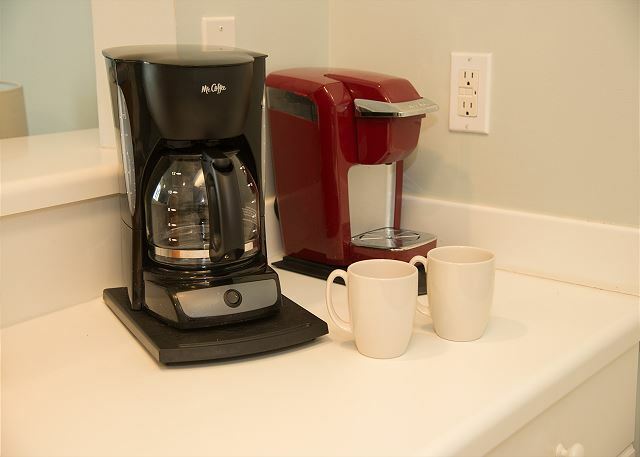 There is a Keurig coffee maker that I didn't know about along with a standard coffee maker. Unfortunately, we had already bought regular coffee for the standard maker. The master king size bed was was very comfortable, the DVD player in the living room was missing the HDMI cable so we used the cable from the master bedroom then replaced it back before leaving. They had just about every kitchen utensil you could think of. 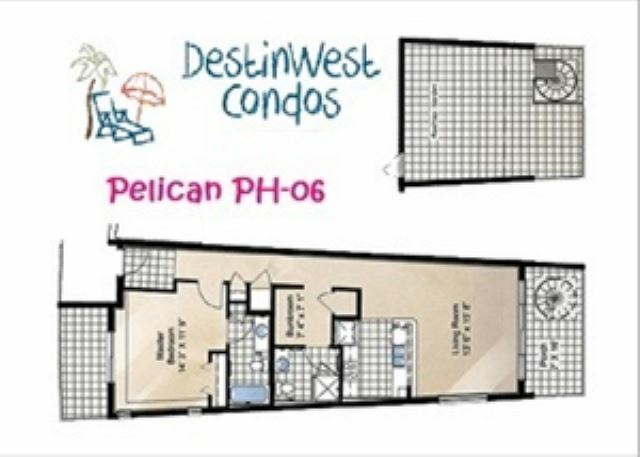 My family has vacationed at Destin west the last 4 years in 4 different penthouses, Pelican PH6 was the nicest. We will stay here again. The owner is very nice to work with and talk to. This was our first time to the condo and the first time to Destin. Both exceeded our expectations. The condo has so many amenities that we didn't even use them all. Fudpuckers is right next door, the Gulfarium is not too far (we walked). We would definitely come back and stay in this unit. It would have been nice to notify us that the lazy river and pools would not be available due to resurfacing since this was the selling point of the property. We were very unhappy to learn about this upon arrival. Hi Shane! Actually, the lazy river was open the entire time of your stay. We recently had some work done to the entire pool deck, but at the time of your arrival it was open and operating. I did hear that there was still Caution tape around some areas from one of our other guests, but I called on this as soon as we heard about it and the tape was removed. It is my understanding that people were still floating around the lazy river even when the caution tape was out. We just wish you would have called us so that this could have been established earlier in your stay. The place was clean and very comfortable. I really enjoyed my stay. I especially liked the view the top deck offered. I went up and watched the sunrise and sunset on many occasions. Place was clean, bed was comfortable. Views of the bay beautiful. We thoroughly enjoyed our stay at Destin West PH-06. We love Destin West! This was our second summer visiting DW and we had a spectacular vacation experience. 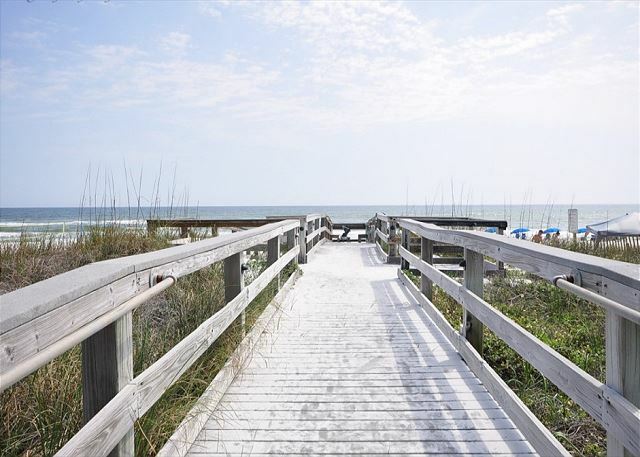 Everything was fantastic from the condo to the amenities, and the beach. 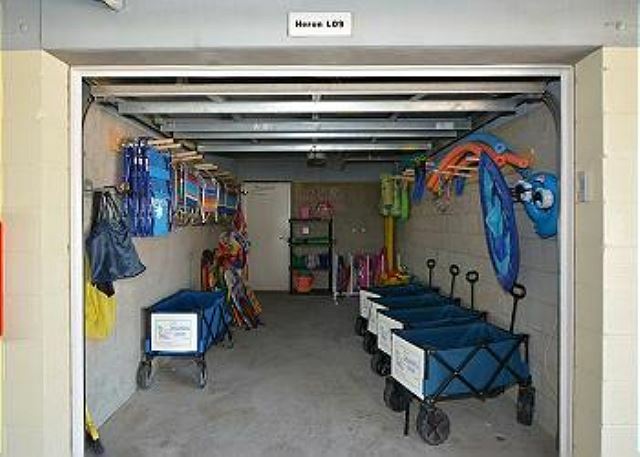 We love the convenience of being close to Destin but not right in the midst of all the added bonus is the garage full of beach gear so we didn't have to haul chairs and umbrellas in our vehicle. This was our first year renting a penthouse and we will definitely do this again. The view was awesome as well as the ability to grill out. For the cons: I did not care to have to have two separate bands to wear but that was a small inconvenience. The beach seemed much more crowded this year and seemed to be related to the way the blue "for rent" chairs and umbrellas were placed in a large U shape. This may not be something you all can control but was a pain nonetheless. This seemed to push the beach goers to the left onto the SeaSpray part of the beach. Again, these are not deal breakers for us and did not necessarily deter from our vacation enjoyment. Just observations I noticed as differences from 2015 to 2016. We will definitely be back and will be looking to book next years vacation in the coming months. Beautiful condo with a breath taking view. Very convenient when you have younger children. We have stayed twice at this condo and hope to stay again soon. The view from the balcony overlooking the lazy river is breathtaking at night. I enjoyed my morning coffee on the upper deck watching all the boats out on the bay. The kids enjoyed having tv's at the foot of each bed in the bunk room. Wonderful restaurants in every direction. 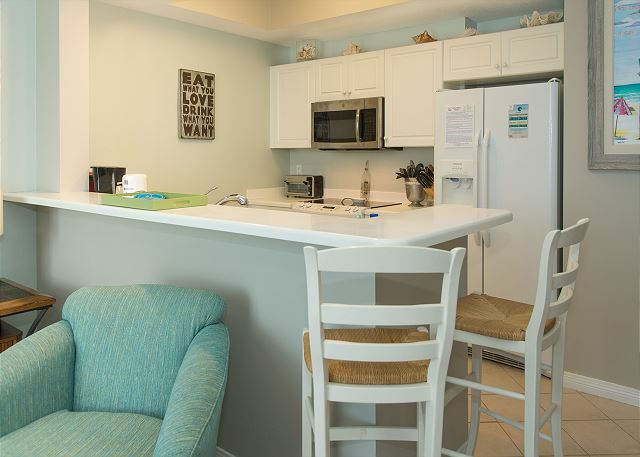 Every convenience of home and a friendly helpful staff make this rental ideal for the perfect get away. Definitely a great homey feel to the place. Although, I believe that the room could be polished a bit more with some fresh paint. Thanks for the positive feedback. Just so you know though, the condo was actually just repainted in March. Rental units typically take a lot of wear and tear but we are having our maintenance crew go up and look at it today. We had a wonderful time at DestinWest. It was our first time to the Emerald Coast. DestinWest was the perfect location and allowed us to enjoy both the bay with pools and lazy river along with the beautiful white sandy beach. Located between Fort Walton Beach and Destin was perfect for shopping needs. 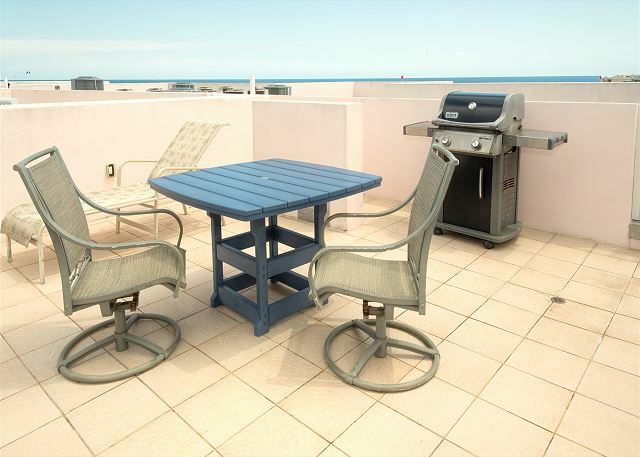 Restaurants were within walking distance and the fully functional kitchen and BBQ grill allowed us the option of cooking at the condo. The view from the condo was beautiful. We were able to see dolphins playing in the bay while sipping our morning coffee. We plan to visit again. 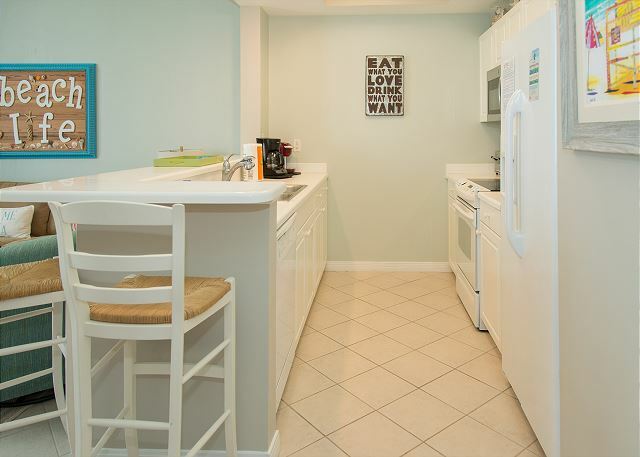 I stayed here for work actually and I was very impressed by the location, amenities and the condo itself. It was very clean and met all of my needs. I would definitely stay here again and plan to do just that in February! Julie was EXCELLENT and very attentive to my needs!! !